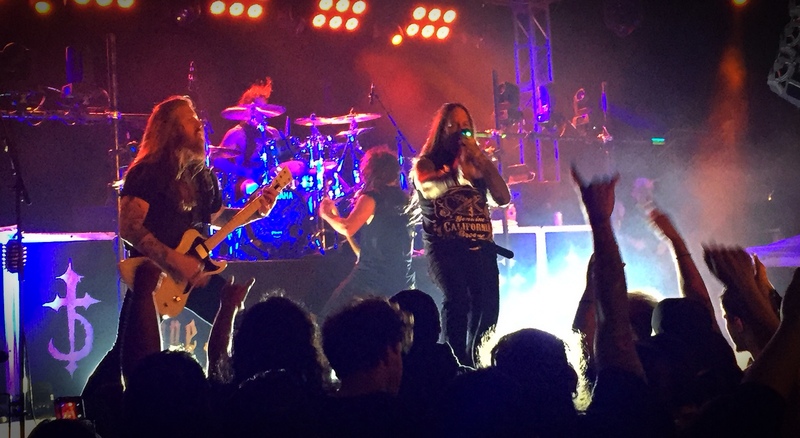 DevilDriver’s headlining Bound by the Road tour came into Dallas last night with an eclectic package of bands to play a stuffed Gas Monkey Bar n’ Grill. I’m not sure the show was sold-out, but it was certainly full. I missed opener Azreal as I was interviewing Death Angel guitarist Ted Aguilar (stay tuned! ), but I caught everyone else. Canada extreme metal band The Agonist played a damn good set. I’ve never heard of this band and was not previously familiar with their material, nevertheless I enjoyed their set. Originally fronted by Arch Enemy’s Alyssa White-Gluz, the band now features Vicky Psarakis on vocals. Psarakis’ vocals range from guttural growls to soaring leads and the energy she brings to her performance is engaging. All around, the band is tight and played like they knew their material inside-out. The Agonist, Gas Monkey Bar n’ Grill. Photo by J. Kevin Lynch 2017. Winds of Plague, Gas Monkey Bar n’ Grill. Photo by J. Kevin Lynch 2017. California deathcore band Winds of Plague followed and I personally abhorred their set. Every single song sounds exactly the same – in fact, it all would’ve come across as one long song if it wasn’t for the long-winded audio samples about the government and whatnot that played between. That said, their fans were certainly out in force and received the band warmly. Fist pumps and head banging were bountiful, the pit got more violent, and by all outward appearances they played a good set. Again, I thought they were terrible. Objectively, there are some good players in the band – their drummer is solid and their guitar players had some cool moments. Death Angel, Gas Monkey Bar n’ Grill. Photo by J. Kevin Lynch 2017. DevilDriver, Gas Monkey Bar n’ Grill. Photo by J. Kevin Lynch 2017. Finally, Bay Area thrash legends Death Angel took the stage for a 40-minute, career-spanning set. Opening with the classic “The Ultra-Violence,” from their 1987 debut album of the same name, the crowd instantly knew they were in for a treat. The band also played “Evil Priest” from The Ultra-Violence album, but the rest of the set was comprised of songs from the bands reunion era. The band played songs from The Dream Calls for Blood, The Art of Dying, Relentless Retribution, and a couple of tracks from last years The Evil Divide. To a man, each member of the band was spot-on. Front man Mark Osegueda interacted with the crowd between songs, encouraged mosh pits, and more than once thanked the crowd for the opportunity to play. The last time Death Angel was here they opened for Slayer and Anthrax. Hopefully, their next trip to Dallas will be on a headlining tour. A little after 10:00, DevilDriver took the stage. At this point, the crowd had been perfectly “warmed-up” and were eager to see the headliners. The majority of DevilDriver’s set was comprised of songs from their 2003 debut album and it’s follow up, 2005’s The Fury of Our Maker’s Hands. Otherwise, they played a couple of songs from The Last Kind Words and Winter Kills albums, two songs from last years Trust No One, and a decent cover of AWOLNATION’s “Sail.” Front man, Dez Fafara seemingly had the crowd in the palm of his hand. Whatever he implored them to do (circle-pit, sing-along, fist pump), the crowd obliged. I’ve never been the biggest DevilDriver fan and this was the first time I’ve seen them live, but I was impressed. The band is professional, the musicians are talented, and they deliver a high-energy, rocking set. There are only a few dates remaining on this tour. If this package is coming to your town it is definitely worth checking out.